Do you know who needs to get used to working surrounded by really gorgeous executive office furniture? New Orleans law students do! These young women and men may go on to be some of the brightest attorneys of the 21st century. They deserve the best. If you’ve ever read Ray Bradbury’s short story, “The Wonderful Ice Cream Suit”, you know that the clothes make the man. In the same way, office furniture might make the lawyer. Law school shouldn’t be where dreams of money, prestige and the pursuit of justice go to die. It should be where these dreams are born. That’s the perspective of Loyola University Law School, one of our showcase clients. It’s easier for students to take themselves seriously while working in an opulent space that makes them feel important. Hopefully, they end up with a corner office and their very own luxurious furniture one day. For now, they can train with an emulation of the real thing. The law school decided that they wanted student workers to feel like they were employed in a successful law office. But, like most educational institutions, they didn’t actually have a huge budget to spend just to make an impression. Solid wood furniture and a build out of the space weren’t on the table. It would have cost too much and caused too much downtime. Furniture That Looks This Good Should Be Illegal! The Office Planning Group used wood veneered systems furniture with decorative details to look like the real deal. These modular pieces included worksurfaces, storage furniture, and even architectural walls to create meeting rooms. In the end, it all looked very posh and respectable. Of course, it came in within the client’s budget and accomplished their goals with minimal disruption. We’re always careful to keep our commitments to our clients. But when you’re dealing with a bunch of attorneys, that contract has an extra degree of gravitas. Does your business need affordable executive office furniture? New Orleans Office Planning Group can make your office space look like a million bucks for less! 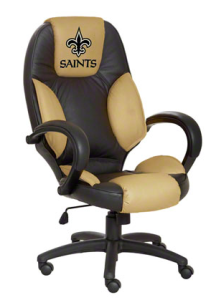 A Leather Office Chair New Orleans Football Fans Can Love? Are you a big football fan? Are you in the market for a leather office chair? New Orleans Saints fans will be happy to know there is a seating option designed specifically for them. You can prove your team loyalty by parking your rear in a brown and tan chair embellished with your beloved fleur-de-lis from 9 to 5 every weekday. Don’t worry, this is no knockoff. It’s officially licensed by the NFL. 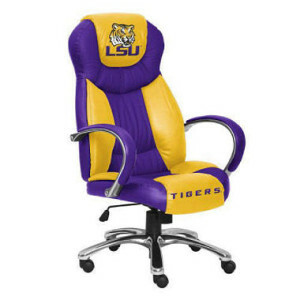 If college football is more your style, you can also get quite an eye-popping purples and gold LSU Tigers chair instead. The vendors of these furniture masterpieces claim to offer the best seats in the house – but are these the best seats in the office? The pricing for these chairs is actually quite modest. They run somewhere between $350 and $400. But when you start to break down what that actually includes, the chair starts to seem a little cheap. You’ve got to figure at least $100 for the cost of the “top grain” leather and another $50 to $75 for the custom logo work and license fee. That means you’re probably looking at a $250 office chair that’s been tricked out to appeal to the white collar jock. If you’ve ever bought a chair in that price range, you probably know that they don’t feel good for very long. The degree of adjustability is pretty limited. Plus, after a few months the padding gets flattened like a slow quarterback. By the time a year is up, you’ll be ready to retire that fancy leather office chair like it’s Don Fleming’s jersey. You may find yourself wishing you had spent more on function than form and bought a really ergonomic office chair. Got more suggestions? Share them in the comments. Where do you turn when your organization’s multi-hued scheme calls for dramatically colorful office furniture? Louisiana Federal Credit Union Gramercy chose The Office Planning Group to be its pigment matching mastermind. We put together a color board that made it simple for this client to coordinate all their furniture finishes. From chairs and tables to cubicles, desks and lounge furniture, every room in the building is perfectly outfitted with style and flair. We think you’ll agree that the state of this union is something to behold. This was no simple two or three toned scheme. That’s because LFCUG is no ordinary financial institution, relying on gray, beige, and blue to give the impression of stolid history. 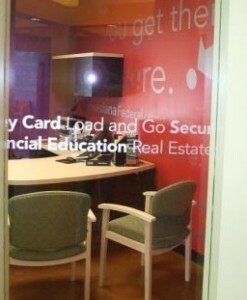 Instead, this credit union has a logo with five colors – and they wanted each one fully represented in their office space. Check out the slideshow at the top of the page in our gallery to see the stunning effect of an entire interior done with deep, rich colors in every room. No timid white paint with an accent wall here and there. These guys went all out as a way to highlight their progressive, innovative, and highly personable organizational culture. We get the idea that money doesn’t just come to this credit union to work for customers, it comes here to play! It might seem like making a color book is a small job. But if you ever browse the textile, laminate, veneer and paint finish options at a major office furniture manufacturer’s site, you’ll find that the wealth of choices is astonishing. Picking just one or two materials for a straightforward color scheme would take quite a bit of time. Coordinating colors and materials that match, blend with, or complement five colors is enough to blow anyone’s mind. Fortunately, our team of professional designers knows this stuff like the back of their hand. They have the eye to create a cohesive look even with so many disparate elements. We don’t consider any job too small or too complex. Let us be your go-to designers for your next rebranding effort! Are Your Metairie Cubicles Safe to Breathe In? Did you know that more than 40% of Americans live in areas where simply breathing the air could be hazardous to their health? The American Lung Association released a report last year about the poor air quality in hundreds of areas across the US. Nine parishes in Louisiana received an “F” rating for high ozone levels. Ongoing exposure to high levels of ozone can cause wheezing and coughing, trigger asthma attacks, and even increase the chances of premature death. Are You Living in a High Ozone Zone? “Most people spend as much as 90% of their time indoors – at home, work or school. It has been well documented that exposure to poor indoor air can contribute to health problems including headaches, asthma, dizziness and prolonged chemical sensitivities.” One of the sources of indoor air pollution is the emission of large quantities of volatile organic compounds (VOCs) from surfaces and finishes. 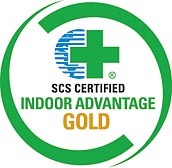 One of the ways The Office Planning Group helps lower your risk of exposing workers to indoor air pollutants is by participating in the SCS Indoor Advantage Gold program. This organization certifies compliance with “rigorous indoor air quality emission requirements for interior building materials, furnishings and finish systems”. We can source products, paints, coatings, adhesives, sealants, wall coverings, furnishings, and other items for your office that are all SCS certified to keep your office air healthier to breathe. 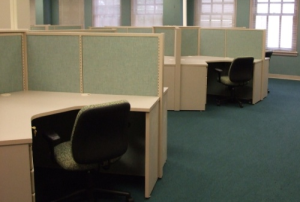 Even your new Metairie cubicles can be sourced from an SCS certified manufacturing partner to make sure your employees have a safe space to work. Call us today to learn more about how to pick the best office furnishings to promote excellent indoor air quality. The most obvious drawback of buying secondhand office cubicles is that you have a narrower selection. However, some customers actually find that to be a plus. Business owners who are looking to equip an office fast don’t necessarily need to look at 100 different options. They just need good quality cubes that can be delivered and installed ASAP. The other potential issue with buying secondhand is that you may have to compromise on having everything match. However, there are ways around this. For example, OEM parts are still available to expand and reconfigure cubicles for many of the most popular models from leading furniture makers. We know how to identify the exact items you need when it’s time to expand. Or, we can help you decide whether a mix and match approach will work with similar but not identical cubicles. Are you concerned that you don’t have the budget to carry through with the ideal version of your office space planning? Louisiana State University’s Healthcare Network faced the same problem. 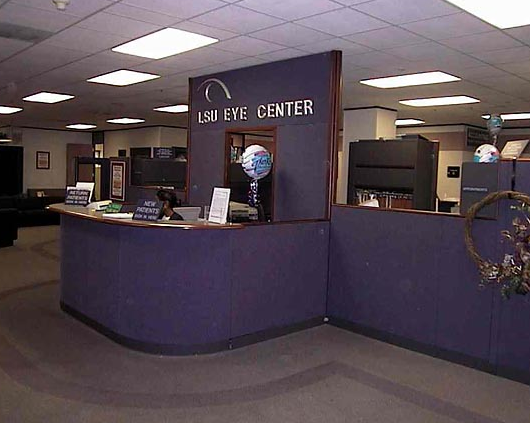 The University’s Eye Care clinic was strapped for cash but had an ambitious concept in mind for their offices. Their idea was to have built-in wall and cabinetry features throughout the clinic. They just didn’t have the funds to make that happen. If you’ve ever priced a retrofit of a built space, you know it’s a big project with a lot of associated costs. First, you have to tear out what’s already in place – which is a highly disruptive and messy process. It’s not just the interior walls that have to go. The carpet has to come up as well since the new walls can’t simply be built over existing carpet. Then, you have to somehow schedule renovations including cutting, sanding and painting without shutting down your entire office for the duration. You’d better be very, very sure of your final plan, too. Making changes later isn’t going to be an option. Drywall construction is also a wasteful process since the materials you remove can’t be recycled. Plus, you cut out doors and windows after the new walls are built, sending even more material to the landfill. Dealing with dust and VOCs from the demolition and reconstruction process can pose significant indoor air quality challenges as well. Our cost-effective and easy to install solution for the Eye Clinic involved using systems furniture to create a new internal landscape. Our highly efficient team installed the whole shebang over the weekend so not a single patient appointment had to be rescheduled. There was no need to rip up the carpet or interfere with any of the internal structure of the building. These deep purple workstation panels and movable walls aren’t just eye-catching. They are also flexible if the client needs a future redesign. In fact, organizations save money compared to built-in solutions every time they reconfigure. It’s ROI that keeps giving you a return. Plus, most systems furniture can be recycled at the end of its lifecycle instead of being dumped in the landfill. That makes these purple walls pretty green if you ask us! 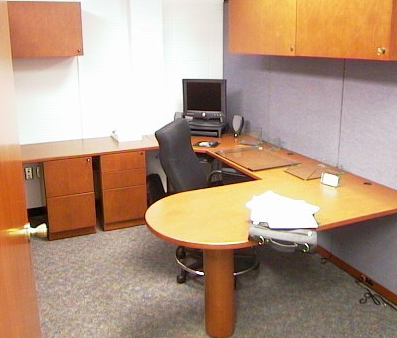 Need to save money on office space planning? 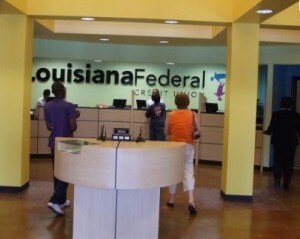 Louisiana businesses in and around New Orleans can contact TOPG for a free consultation. This kind of office space supports and increases the engagement level of workers by making a statement about the purpose of your business. Today’s workers know they are likely to change jobs many times over the course of a few decades. You can’t count on loyalty based in job security to motivate employees anymore. They know spending a lifetime with one employer is unlikely. So, you need a way to make them excited about coming to work – and a way to attract new talent when your current employees move on to their next job. When employees feel their work has purpose, they become self-motivated. At The Office Planning Group, we have extensive experience advising organizations on ways to brand their workspace to be consistent with their stated mission. We can help you revamp your existing space with the right changes or give you a fresh start with an entirely new layout and furniture. Our consultation process is thorough and will save you a huge amount of time and money in deciding on the perfect direction to take your office design. 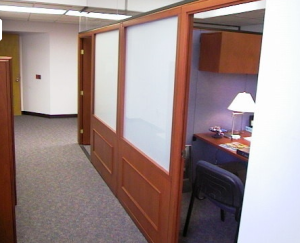 When you have limited room in your office, there are a few things you can do to help conserve space with your office cubicles. New Orleans Sewerage and Water Board is one client we helped with just this issue recently. This utility company deals with waste all the time, but they don’t want to waste space! The water, drainage and sewerage systems in New Orleans were honored in 1973 as one of the top ten most outstanding engineering achievements in the state. We can’t say the way we engineered the spatial optimization in the offices of the Sewerage and Water Board matches that, but the solution our team came up with is pretty great. The Office Planning Group got creative with this client’s offices to fit a large number of customer service personnel into a small space. Our goal was to create a work environment that was functional, comfortable, ergonomic and functional – and one that didn’t make workers feel cramped. That’s always the sticking point when you have to fit lots of workers in a limited area. However, we used clustered office cubicles to solve that problem. These cubes aren’t actually square or rectangular. Instead, they feature several workstations connected together around a central hub like petals on a flower. The worksurfaces are narrower in the front and open out to a wider angle on the sides. This gives the sense of working in a more open space instead of a box. Workers have panels in front of them to help dampen sound. This also helps create a little bit of visual privacy. They aren’t staring at their coworkers all day and have more of a sense of personal space. At the same time, the open back of the workstation means they don’t feel too enclosed. They can readily invite in coworkers when advice or collaboration is needed. The wide V shape of the desktop provides space on both sides of the user without taking up nearly as much room as a traditional U shape desk. There’s even enough room for filing at each workstation.